What does French stoneware from the 19th century have in common with the camera used to make Hollywood’s first feature movie and a miniature etching bearing the well-known slogan, “War is unhealthy for children and other living things”? As random as they seem, all of these items help tell the story of Jewish life in Los Angeles. Lorraine Art Schneider (United States, 1925-1972), Primer, 1966, etching. Loan courtesy of Carol Schneider and Family. 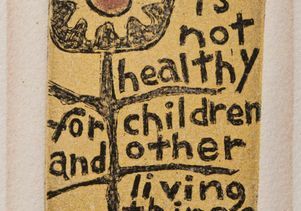 This image became the logo of the organization, Another Mother for Peace, and the most famous anti-war poster of the Vietnam War era. Schneider was the daughter of Jewish immigrants. Photos by Susan Einstein. The Autry National Center is recounting that tale through these and 150 other artifacts that document local Jewish history, and it is doing so with assistance from UCLA faculty, students, alumni and the university’s extensive library system. “This is an incredible realization of a kernel of an idea,” said history department chair David Myers as he surveyed “Jews in the Los Angeles Mosaic” exhibit at opening festivities last week. On view through Jan. 5, the exhibit had its origins in a graduate seminar that Myers and fellow UCLA history professor Stephen Aron taught in 2005 on the history of Jews in LA. “We figured out what had been done, what hadn’t been done and what could be done,” recalled Aron, who, in addition to teaching at UCLA, serves as executive director of the Autry’s Institute for the Study of the American West. One of the students in the seminar was Karen S. Wilson, who received her Ph.D. in history from UCLA in 2011. 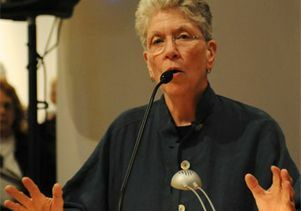 She went on to curate the exhibit, which traces the evolution of Los Angeles’ Jewish community as it grew from a group of eight bachelor merchants to the second largest in the nation and the fourth largest in the world. Jewish life in Los Angeles harks back more than 160 years; and that represents a relatively few moments in their epochs-long history, Wilson said. 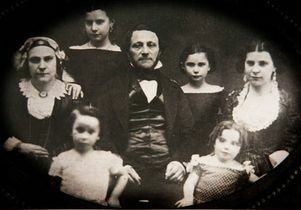 Rosa and Joseph Newmark and children, circa 1850s. The Linda Levi Collection of Newmark and Levi Family Memorabilia, Braun Research Library Collection, Autro National Center. The Newmarks were one of the first Jewish families to settle in L.A. Included in the exhibit, the French stoneware belonged to the extended Newmark family who came here in the early 1850s when the city’s Jewish population numbered less than 100 people. And the camera — acquired from Jessie Lasky’s Famous Players Studio — dates back to 1913. It was used to film “The Squaw Man.” Produced by Lasky and Cecil B. DeMille, the movie was the first feature-length film made specifically in Hollywood. The etching, done by Jewish artist Lorraine Schneider who was born in Boyle Heights, was created in 1965 and has come to be an iconographic reminder of the Vietnam War era. “It’s my favorite piece in the exhibit,” confided Wilson, a lecturer in the history department and the Sady and Ludwig Kahn Research Fellow with the UCLA Center for Jewish Studies. Also on display at the Autry is an item that reflects a show-biz tale of Jewish contribution to L.A.’s cultural history: a giant, sheepskin-like scroll with 1,000-plus signatures (including Judy Garland’s) that Max Factor gathered from guests attending a huge party celebrating his cosmetics studio and factory in Hollywood. There’s an Andy Warhol silkscreen portrait of Jewish art collector Marcia Weisman, who helped create the Museum of Contemporary Art. Visitors can also see a section of a stone column that came from a synagogue where the first Jewish congregation in Los Angeles gathered. The stone capital is all that remains of the building that was once located at Ninth Street near downtown in the 1890s. That congregation eventually became one that today attends services at the Wilshire Boulevard Temple. The exhibition’s items and artifacts are an eclectic and esoteric mix, as befits a people who came to Los Angeles in ever-increasing numbers from Europe, Asia, the Middle East and all across America. Today, there are more than 600,000 Jews in greater Los Angeles, and they form what Wilson believes is the world’s most diverse collection of Jewish residents. * "Los Angeles Cookery," an 1881 cookbook that includes recipes from Jewish women. The cookbook was published by the women of the Fort Street M.E. Church. * A letter written by the famed conductor Otto Klemperer recommending renowned composer Arnold Schoenberg for a UCLA faculty position, which he eventually accepted. Both men, who were Jewish, settled in Los Angeles after fleeing Europe when the Nazis rose to power. * A photograph taken during the 1930s and ’40s in the Pacific Palisades of Schoenberg, Klemperer and Austrian conductor Ernst Toch, another Jewish refuge of Nazi Europe. * "Hollywood Film Capital of the World" map, 1946. The movie industry was established here by Jewish moguls. * A 1962 Gold Record for "The Lonely Bull," recorded by Herb Alpert, who is Jewish, and the Tijuana Brass. * A circa 1973 bumper sticker from Tom Bradley’s second mayoral campaign, which received considerable backing from Jewish individuals and organizations. The exhibit shows how that attitude was instrumental in the landmark 1973 victory of Los Angeles’ first and only African American mayor, Tom Bradley, as well as delightfully quirky displays of multiculturalism. 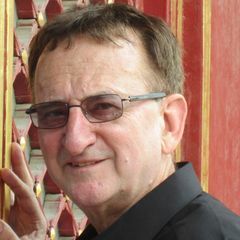 For example, at a listening station, visitors can enjoy the musical styling of Mickey Katz, father of entertainer Joel Grey, and other “Spanish Jazz Popular Classical” music made popular in Boyle Heights, an area that brought together Jewish, Japanese American and Mexican American immigrants in the 1930s. But the exhibit also illustrates the melting pot’s underbelly. Wilson dredged up a 1939 government map that banks used to justify red-lining Los Angeles neighborhoods based solely on their ethnic diversity. Boyle Heights, for one, was characterized as “hopelessly heterogeneous,” a community trait that blocked many hard-working families from obtaining home loans. “I like to see Boyle Heights as hopefully heterogeneous,” Wilson quipped. In addition to curating the exhibit, she also edited the exhibit’s hefty catalog, which includes a chapter by UCLA history Ph.D. candidate Caroline Luce, who unearthed the unlikely story of a politically influential bagel-bakers union in Boyle Heights. 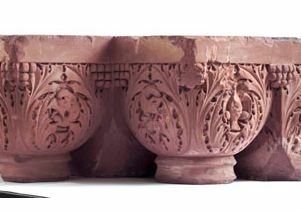 Stone capital from exterior synagogue column, circa 1896. Courtesy of Wilshire Boulevard Temple. 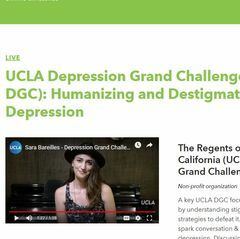 Another significant contribution by UCLA to the exhibit is a giant digital map that documents the decade-by-decade growth of Jewish influence locally in philanthropy, education and social services. Elliot Yamamoto, a senior majoring in architectural studies, helped build the map, with information from Mapping Jewish L.A., a UCLA-based online project that links the history of Jewish neighborhoods and communities throughout Los Angeles with historical maps, cultural artifacts and archival materials. The website, which Wilson curates, elaborates on the development of Boyle Heights, once the center of Jewish life in Los Angeles and home to the largest concentration of Jewish residents in the western United States. 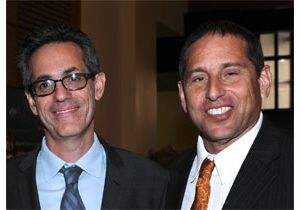 "The UCLA Center for Jewish Studies is especially proud of the collaborative vision in realizing an exhibition of this scale and historical significance," said Todd Presner, the Sady and Ludwig Kahn Director of the UCLA Center for Jewish Studies. "The partnerships with the Autry, the UCLA Library and Special Collections, the History department, and numerous community organizations are reflected in the diversity of perspectives presented in the exhibition." “UCLA allowed us to think ambitiously and expand our scope, and that’s a wonderful place to be,” said Carolyn Brucken, the Autry’s chief curator, at opening festivities.